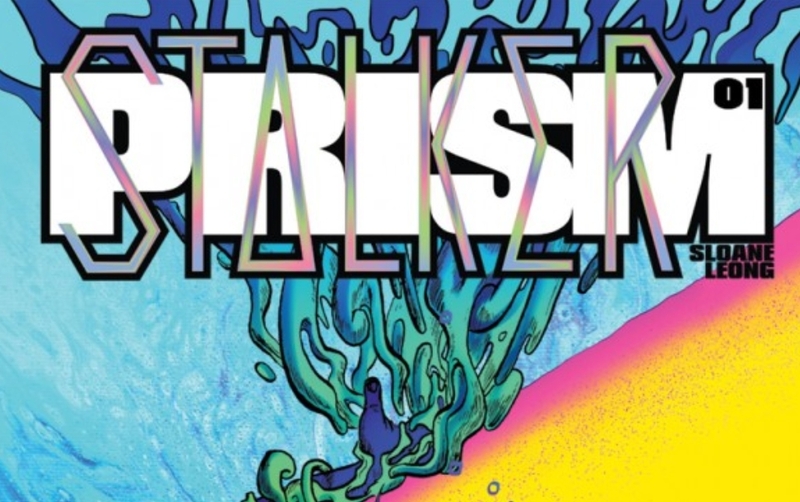 Prism Stalker is a new series from Sloane Leong, a self-taught artist and writer who has done guest artist work for Image Comics and D.C. Comics, but got full artist credit for the series From Under Mountains issues #1 through #6 for Image in 2016. Sloane gets a chance to not only draw, but to write Prism Stalker. To not only create your own story but also to create the world it’s in just shows the talent and creativity someone has. I’m used to see a list of names to create a comic, but was surprised to see Sloane’s name stand alone. We follow a young woman named Vep, a refuge from the planet Inama that had some type of virus outbreak that has left her world abandoned. She lives with other “displaced exiles” including her mother and as what it seems, a younger sister on a planet (really referred to as an “Asteroid”) ruled by creatures known as Sveran, large insect like aliens that have Cordyceps (a type of fungus infection found in insects) as if it acts as armor. In exchange for shelter and food, the refuges are used as gatherers to retrieve large eggs from the Sveran queen to be consumed by other Sveran. These eggs are removed from the queen’s tentacles through what appears to be whistling or some type of humming for the eggs to pop out. But a certain pitch needs to be executed to work otherwise the queen’s defenses of spiked spores are activated, certainly causing injury or death, not to mention the possibility of falling off the tentacles. As Vep saves her sibling from a mishap, it catches the attention of Sozerin, who doesn’t look like a Sveran, but has more of an animal form to him other than insectoid. A mix of a panther and a velociraptor. He represents a group called The Chorus, a faction that aims to create new settlements in newly discovered planets. After Vep pushes back against the idea, Sozerin reminds her of the terms of sanctuary, “custodial power over displaced exiles and offspring”. Vep doesn’t have a choice and doesn’t even get to say goodbye to anyone. Vep is unceremoniously incapacitated, ending issue #1. Art work is excellent and fitting for the “Biopunk” subgenre. The Sveran are creepy with the aforementioned Cordyceps like armor, but their hind and front legs look slimy instead of sturdy along with the molten gold crown like headpiece they adorn. my favorite piece from Prism Stalker is an all red area with pods that are used by the exiles to sleep in. It’s very minimal, as if a poinsettia grew on top of another poinsettia. I really liked the use of color as well, we aren’t restricted to dark tons were many scifi comics go. I did have a hard time following the narrative after my first read through. The first few pages we get some inner thoughts from Vep. Poetic thoughts, but not much of a set up for the story through words. I felt that I may have missed something the first time, it did take ma a second and third read through to understand we get a lot of the story through the art and not the text. I’m reserved at where Prism Stalker will go from here story wise. I’m not expecting a space opera or deep space horror, but I do expect a fight for survival and a chance at freedom. Posted in Comic Books, Reviews, sci fi.